After more than a decade of arguments in three different courts and thousands of dollars in legal costs, the determination of 41,000 unionized teachers in British Columbia finally paid off when Canada’s highest court ruled in November that the provincial government’s contract stripping in 2002 was unconstitutional. 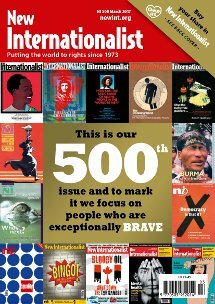 So begins one of several global news stories loyal New Internationalist readers can feel good about, as the magazine celebrates its 500th issue this March, 2017. I interview BC Teachers’ Federation President Glen Hansman about the impact the win has on teachers, education and all working people.